£11 *approx - check retailer for live price. A game called Did You Ever? vs Would You Ever? which is designed for hen parties. 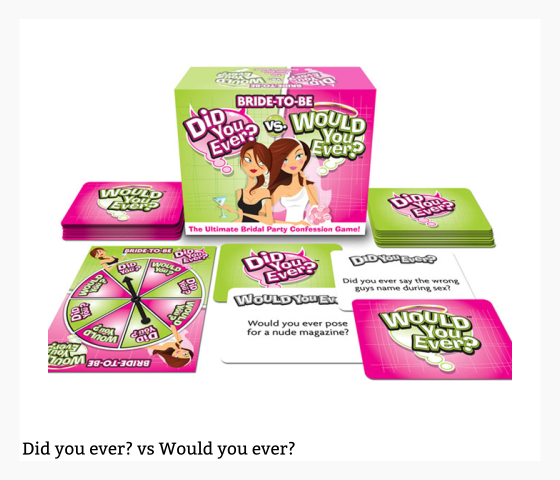 If you’re preparing a rowdy hen party then this game is worth a look in. Get the wine flowing and bring this out. This simple game has a board with a spinner and you pick cards which give you awkward questions to ask to the friend whose turn it was to spin the board! Find out all sorts of little naughty secrets, not only about the lucky bride to be, but about all the guests! A simple game that can bring some fireworks. Be careful if you have a slutty friend, you may not want to hear the answers to the questions this game will ask them! Please note: although the minimum order value on this website is £10, this product qualifies for the minimum value so if you don’t wish to buy anything else then you can still order this.